Does smoking affect oral health? What happens during my hygiene appointment? Today, Dr. Philip Friedman and our team at Dr. Friedman, DDS thought we would talk about mouthguards, what they are, where to get them, and when to use them. Q: What is a mouthguard? A: A mouthguard, which is made of soft plastic, is a flexible, removable device that fits in your mouth and is adapted to fit comfortably to the shape of your upper teeth. A mouthguard will protect not only the teeth, but also your jaws, lips, tongue, cheeks, and gums, and should be worn anytime you are participating in full-contact athletic or recreational activities that may result in injury. Q: How do mouthguards work? Why are mouthguards important? A: A mouthguard works as a shock absorber to cushion your mouth from the effects of a blow to the face, head, or neck. Mouthguards protect teeth from not only fractures, but also hold the tongue, lips, and cheeks away from the teeth to avoid lacerations. Using a mouthguard as instructed by Dr. Philip Friedman can lessen the possibility of concussion and temporomandibular joint (TMJ) dislocation while you are out on the court or field. Increasingly, organized sports are requiring mouthguards to prevent injury to athletes, and research shows most mouth injuries occur when athletes are not wearing mouth protection. Q: When should I wear a mouthguard? A: Whenever you are participating in an activity that involves a risk of falling or head contact with other players. This includes football, baseball, basketball, soccer, hockey, and other competitive sports. Q: How do I choose a mouthguard? A: Dr. Philip Friedman and our team encourage you to choose a mouthguard that you can wear comfortably. There are several options of mouthguards you may choose from. First, preformed or what we call “boil-to-fit” mouthguards are found in sports stores. But your best choice is asking us for one during your next visit as we can fabricate a custom mouthguard for you at our Savannah, GA office. 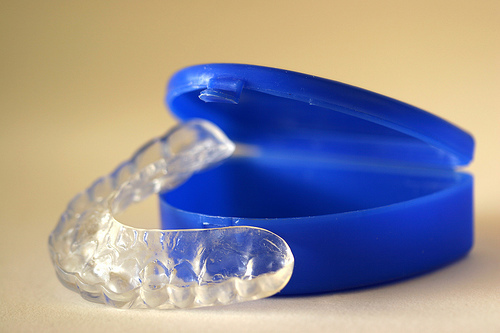 A custom mouthguard will be more comfortable to wear and more effective in preventing injuries. If you have any additional questions about mouthguards, please give us a call or ask us during your next visit!